Wet Mountain Valley community members of all ages! All are welcome, and there’s a seat for everyone at our table. Join your friends and neighbors at dinner down the middle of Main Street, with the majestic Sangre De Cristo Mountains as our backdrop. Down the middle of Main Street in Westcliffe, Colorado. The 4th annual Valley Strong Community Dinner will be held at 4:00 pm on Thursday, September 19. 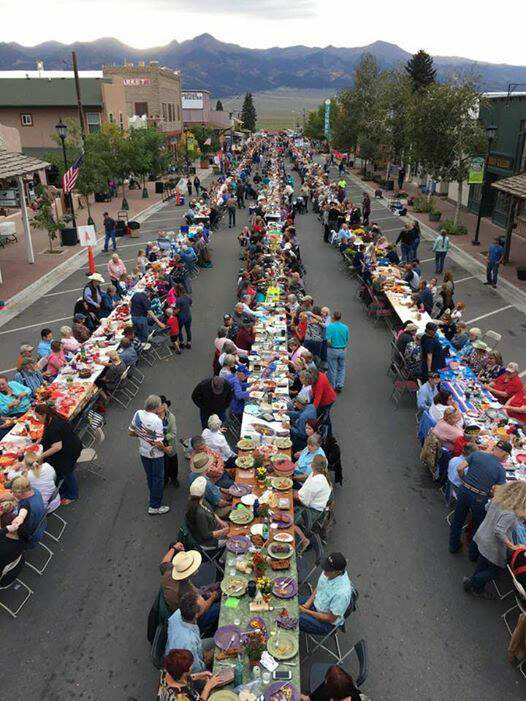 Join your friends and neighbors at dinner down the middle of Main St. with the majestic Sangre de Cristos as our backdrop. We’re a community that’s diverse in our opinions and ideas. On this night, we focus on all we have in common as we eat together at one table. We embrace the people we love and celebrate those we’ve lost, cheer our accomplishments and anticipate the return to “just us” as the summer season winds down. All are welcome, and there’s a seat for everyone at our table. Our beautiful views are surpassed only by the beautiful people that call the Wet Mountain Valley home. The simple mission of the Valley Strong Community Dinner Planning Team is “Just Dinner!” We strive to create a locally funded annual activity where the residents of the Wet Mountain Valley come together in a nonpolitical, noncommercial, non-promotional event to share food and friendship as we celebrate and nurture a sense of community. 4th Annual Valley Strong Dinner … on a Thursday! Here are some ways to help out. You have the unique and simple opportunity to be a host for one (or more) table/s. Financial assistance is also greatly appreciated. Use the buttons below to learn more details about both hosting tables and donating. © 2019 Valley Strong Community Dinner.